I am sure everyone has read over and over again how important food prep is, and we have all heard the “if you fail to plan you plan to fail” slogan being around tossed out there, and although most of us have the best of intentions to get things ready for our week sometimes life gets in the way. Scheduling in exercise, family time, time with friends, rest and relaxation, home renovations, etc., can leave you feeling overwhelmed and I am sure the last thing you want to do is think about planning your meals and making them for the week. So how do you make it easier? Well practice helps, the more you do anything the easier it gets. Think of the first time you laced up your shoes to go out for a run compared to a couple months later. I am sure you will agree that it started getting easier over time, similarly food prep if you stick with it will get easier over time. So to help I have some pretty simple suggestions to help you to become successful at food prep. 1. The time will have to be spend regardless of when you do it. Food will need to be prepared, whether it is right before your meal or on a Sunday afternoon you are going to have to prepare for your meal. The difference is how you want to spend your energy. After a long day of work do you want to spend an hour chopping veggies, marinating meat probably not and it’s these moments where we all tend to reach for the convenience “foods”. By preparing your meals and planning ahead of time you are less likely to go for the “easier”, less healthy option of take out. 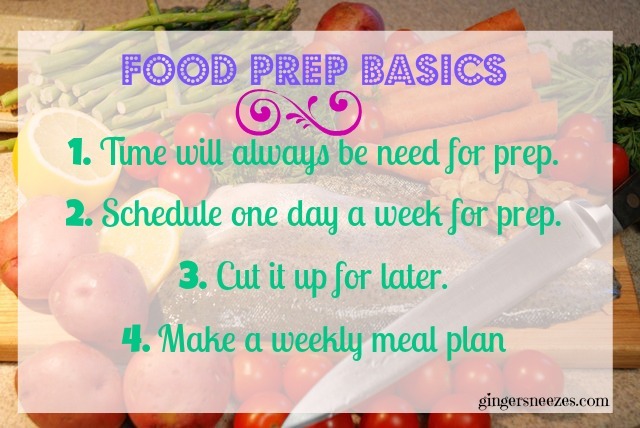 2.Plan to do your food prep for the same day every week. I personally prefer to do it at the “start” of me week, generally Sundays because I find it helps me to organize myself and to help stick to my goals. If spending 2 hours doing food prep on one day is unreasonable for you, split your week up and do prep on two days (at the beginning and in the middle). 3. Cut it up for later. Pre-wash, and prep your veggies and fruits, thaw and marinate meat anything to take a step out of the process. By pre-washing/ cutting/ coring/ peeling/ marinating/thawing your veggies, fruits and meats you will be more likely not to waste and less likely to order out. Maybe not every single one of your meals is planned out to the last detail, but having a fridge filled with pre-cut veggies will make it easier to grab what you need and toss together a meal in no time. 4. Maybe cooking for two hours to prepare your meals is unappealing to you, so do yourself a favour and take 30 minutes to map out your meals and snacks for the week. With a plan written down you will be more likely to stick with it because it removes the last minute planning and guesswork out of the equation. Hopefully these little tips will help you to find something that works for you. There is something that works for everyone, maybe just cutting up your veggies and having your meats ready to go is what is going to work for you, perhaps having everything prepackaged works best. The key is finding something that works for you so you stick to it. Remember that the more you do it the easier it becomes and the faster it gets. Don’t get discouraged keep at it and sooner than you think you will be a meal prepping wizard! Happy Wednesday everyone! I hope you are all enjoy a bit more cool temperatures these days after the little heat wave we just had. I know I will be enjoying it with a nice long run this evening, what will you be doing? This entry was posted in Food and tagged clean eating, food, healthy, Meal, planning, preparing, success by healingginger. Bookmark the permalink.